While there are no large supermarkets on Mull, the island is home to several very well stocked shops (full list here). In Tobermory is the largest, a Co-op Food, where you’ll find everything from fresh vegetables to fish to cakes. You’ll find a well stocked Premier shop in Dervaig, and there are also SPAR shops in Salen (to the south of Tobermory), Craignure (where the ferry comes in) and in Bunessan, in the southwest of the island. Fionnphort has ‘The Ferry Shop’ which also stcoks a range of produce. So, while there isn’t a large-scale supermarket to stock up at, you’ll never be too far from shop-bought provisions in a holiday cottage on Mull. The smaller stores will also have a good supply of logs and kindling available to purchase, should you wish to top up your cottage’s supplies. One of the beauties of self-catering holidays on Mull is the flexibility and choice they give you. You can venture out on any number of nights to sample the local area’s restaurant and pub scene (more on that here, if you feel so inclined). But, it also couldn’t be easier to light the log burner and cosy up with a delicious dinner at home. And while doing so is lovely and relaxing in itself, it’s also kind to your budget, freeing up more of your hard-earned money for wildlife trips and other attractions. Make self-catering holidays on Mull even more authentic by investing in quality, local food, fresh from the island. True to its island nature, you’ll find the freshest mussels, fish and seafood on offer locally here, both to buy and to taste in restaurants. Inverlussa Shellfish at Loch Spelve have a ready supply of mussels for sale. Several farms also offer local meat and produce for sale. If you’ll be paying the Ardalanish Weavers a visit, remember to enquire about their meat. It’s an excellent place to source locally reared, high quality beef, especially if your holiday cottage is located close by, perhaps in Fionnphort, Bunessan or Ardtun on the Ross of Mull. Also nearby is The Crofter’s Kitchen in Kintra. 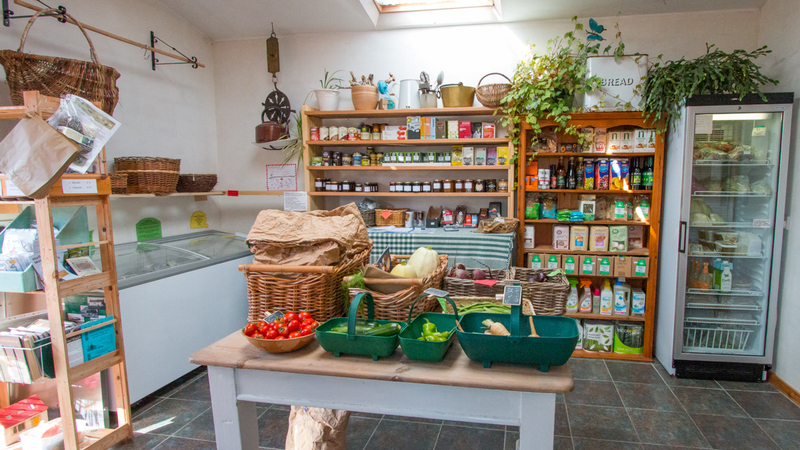 Open from April to October, you’ll find a hearty stock of fresh fruit and vegetables, as well as eggs and local meats, including beef, pork and venison. Enticing jars of jams and preserves will also tempt you. In Tobermory, Mull’s only – and incredibly charming– town, you’ll find a selection of independent producers alongside the Coop. Try the Tobermory Bakery for a homemade treat, or visit The Tobermory Fish Company to purchase that night’s dinner. Just outside Tobermory is the base for Isle of Mull Cheese, where you can sample the island’s own cheese, as well as several others and meat too. What better to return home to after a day out exploring Mull’s wild spaces, than a delicious cheeseboard and a bottle of red wine? Depending on how long you intend to stay, self-catering holidays on Mull also give you the opportunity to visit one of the the local producers markets, which take place in Tobermory, Dervaig and Craignure for more local, homemade and artisan fare. While you may think of supermarket, mass produced dishes when you think of ready meals, the entrepreneurial residents of Mull have brought their own approach to them on the island, helping out those on self-catering holidays on Mull who fancy a night off from cooking. 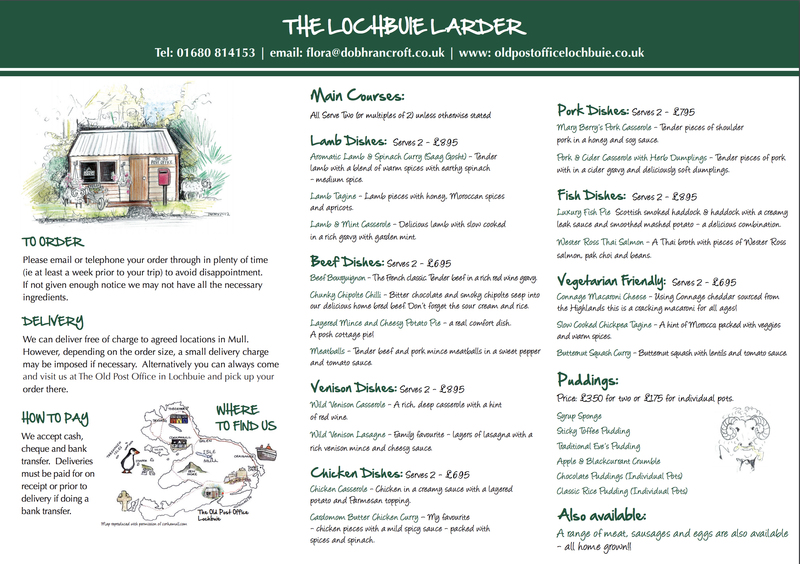 Visit Loch Buie Larder for a whole host of fresh produce stocked in The Old Post Office. They also operate a ready meal delivery scheme, right to your holiday cottage door. Place your order and enjoy a homemade dinner without the hassle. Ready meals have never looked so luxurious or inviting! Where are your favourite places for food on self-catering holidays to Mull?